Penn Manor’s 1:1 student laptop program reached another milestone this past weekend. 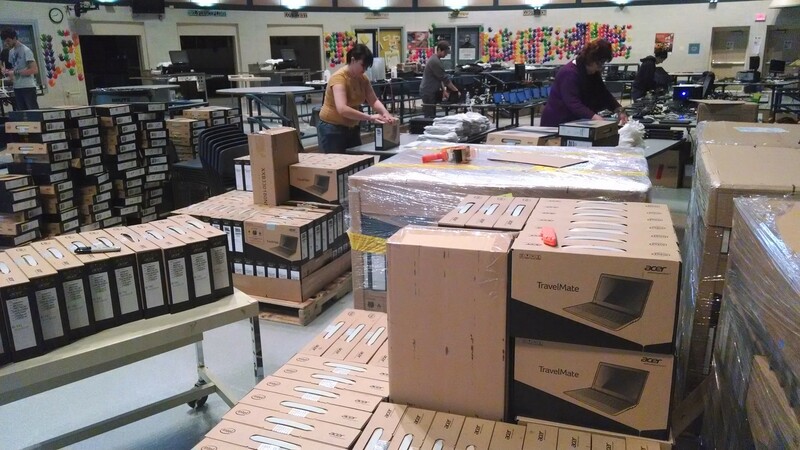 After a two-day setup marathon, 1725 laptops are now ready for distribution and delivery to Penn Manor High School students. Manor Middle School’s cafeteria was transformed into a computer assembly line as the PM IT Team, student help desk apprentices and community volunteers worked to unbox, inventory, configure and prepare the laptops for distribution to students at the start of the second semester. Manually installing an operating system and applications on such a vast scale is impractical. Central to our setup process was a customized software toolkit developed by Penn Manor senior, Andrew Lobos. The software, titled Fast Linux Deployment Toolkit (FLDT), is derived from several open source projects. True to its name, FLDT makes Linux software setup fast and easy. Andrew’s program rapidly copies our custom Ubuntu image from one master laptop to as many as 50 laptops at a time. The entire FLDT copy process completes in less than two minutes and accelerates the process of cloning software to hundreds of laptops. The FLDT system was tested and refined by student tech apprentices over the past several months. It performed exceptionally well as our team processed thousands of laptop images. 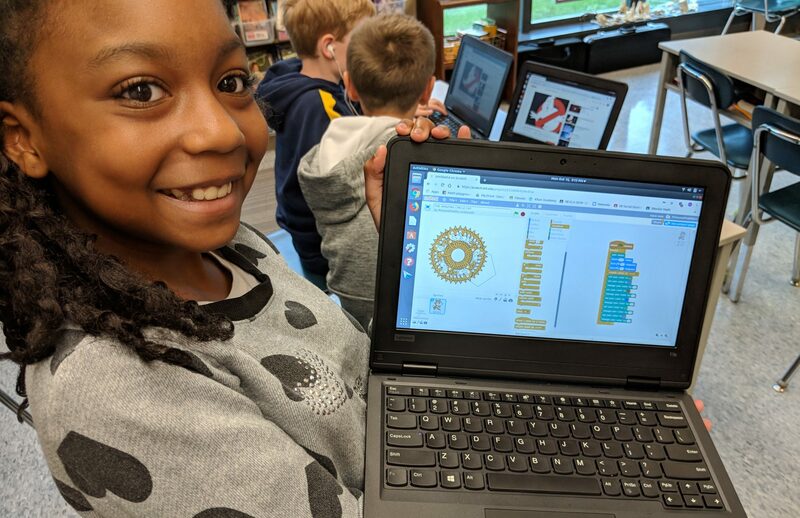 In the spirit of the open source community, FLDT and other district open source projects are available via GitHub, a software development sharing site: https://github.com/pennmanor/. We encourage other schools to freely use and contribute to the code. While the FLDT quickly replicates our custom software images, physically handling and processing over 1700 individual laptops takes a great deal of human effort. A large part of the setup work involved unboxing, labeling, scanning, inspecting and adding laptops to our inventory system. After nearly 24 hours of work with a 13 to 20-person crew, the laptops were ready to be shipped to Penn Manor High School. It is difficult to overstate the incredible power of this learning experience. Pictures simply do not capture how our students demonstrated genuine ownership of the setup process, or their incredible passion for building systems that their peers will use daily. Pride and enthusiasm was palpable as traditional classroom roles dissipated and students assumed leadership roles in their individual functional areas. The project was a potent, authentic learning experience, one that I suspect our students will recollect for the rest of their lives. nice! That must have been very interesting indeed. I’d like to share that at work sometimes we use Clonezilla in a similar method, to simultaneously push over images to multiple servers that need a certain OS setup. It’s very beautiful to see technology like this in action. This great effort also shows inflexibility of the manufacturer for not being able to deploy custom image for such a large order during the manufacturing process. Very intriguing. I’ve been using Clonezilla most of my career, and am curious how this compares. If it’s better, I may opt for this in my environment. I’ve downloaded the source but cannot find documentation now to set this up. Is there documentation anywhere? Perhaps if not and I find this useful, I may consider writing an instructional blog post. Nice factory setup there! I hope the project goes well! Especially involving the users in the process sounds really good. How are you planning to update the systems after the initial install? This and other similar postings finally got me to write about my experiences in managing large linux workstation and laptop fleets. We’ve been doing laptop installations using read-only OS images that use same image as netbooting (LTSP) thin/fat clients. Installation copies over a single 7GB file that contains the OS and all applications and updates are done using diff files in the background. All configuration is done using a management tool that distributes all settings to different clients. This approach doesn’t fit everyone, but for us it’s working quite nicely. Good for you, Penn Manor. You are setting the example for other schools to follow plus you are actually educating your students by providing a real-world experience. They are sharing in the success of their school as it boldly enters the FLOSS world. I’ve been lucky enough to visit the Central Pennsylvania Open Source Convention the last two years where Charlie Reisinger spoke. The shear joy he has for this program, and what the kids get out of it by doing their own thing with the help desk, is beyond evident. He’s not just proud of the program, he’s really proud of those kids. Be cool to see a re-write of some of this using Chef solo. Gets the students using config management tools that a lot of enterprises / companies are switching to and is one of the highest sought after skills in the IT industry right now. Next PostNext The Laptops Have Landed!